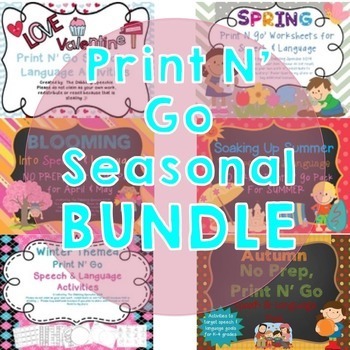 This bundle set includes all of my Seasonal Print N' Go Packs. If you are looking for resources that are LOW PREP and save you time, then this bundle is for you! All of my print n' go packs are black and white ink only, so they are easy to print. You can use these with your speech and language students all year long. Each pack includes worksheets and activities that target articulation, grammar, vocabulary, seasonal games, social skills and fluency skills. Please email me at: thedabblingspeechie@gmail.com if you have any questions.